Did you know that Trinity Lutheran Church has a Sunday School class for two-year-olds and their parents? In the Parents & Two’s classroom, children learn about Jesus and experience God’s love. At the same time, their parents learn how to incorporate Sunday School and daily faithbuilding activities into their family’s routine. The class has music, Bible lesson accompanied by hand puppets, crafts, and yummy snacks. Parents and child do all activities together. If you child is almost two please register for the class with the Sunday School secretary. If you have any questions please contact Karen Hanovich at (912) 656-6511 or talk to some of the parents who have had their child in the class. It’s fun for the children and we guarantee there is never a dull moment. c.) Directly enlists, engages, equips and trains Sunday School Staff members. Pastor Webb is leading the adult Bible study of reading Ezra and Nehemiah. As we read these wo Biblical books we are learning that God is in control of the events on earth and discussing why He uses different rules for His purposes. Join us as we grow in our understanding of our role in the Church today. This study meets in the Social Hall after breakfast at 10 a.m. In the High School Sunday School Class, we continue to have good participation! We had 10 students this Sunday. We are finishing the study of miracles performed by Jesus. We have seen the love, power, and compassion of Jesus. There are different ideas for the next studies. I am leaning to the study of the Book of James. It is such a practical book. It can give many ideas to help our own lives. If you have any questions please contact Bob Hanovich at (912) 655-0048. Our new pin program begins November 1. The pins will represent an achievement and dedication to learning more about their faith. It is completely voluntary. The children, at their own pace, will work towards receiving pins and awards for each milestone achieved towards entering Confirmation Class. For example, pins can be earned for leaning the Books of the Old Testament. More details to come! 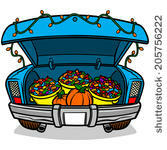 Our next big event is Trunk or Treat on Saturday, October 27th from 6-8 p.m. in the TLC parking area. There will be fun and games, our costume contest and food available for purchase. Each year this event has grown by 150-200 people. This year we are planning for 700 attendess! This will require lots of help so mark your calendars and let us know if you can help. Please see Jennifer or Karen. This is an awesome outreach to our neighborhood and we see the same families each year who also attend VBS and come to the Easter Egg Hunt.